The elated new mother shared the news of her delivery through her Instagram page on Monday with a post-delivery picture. “Thank you guys so much for the love through this journey and thanks for all the well wishes. Love you guys!” she wrote. 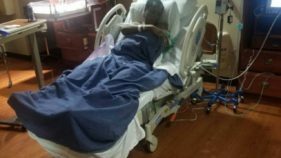 NAN reports that Ikeji maintained a high anticipation for the baby, regularly posting pictures of her pre-natal care and plans for the child fondly called ‘Baby J’.